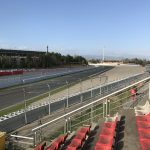 If you’re looking for some inspiration on where to sit at the Circuit de Catalunya, then you’ve come to the right place! We’ve created the guide below to be as helpful as possible in advising you to pick a place to watch the next Spanish Grand Prix from. We’ve taken into account the best place for overtaking, likely place for spins and crashes, the best atmosphere and proximity to the facilities. It’s all covered and we’ve ranked it in order of our personal opinion. The general admission at Catalunya is really good, compared to other circuits around the world. There are plenty of places around the track to choose from with a general admission ticket. Click here to read more. Always one of the most popular places to watch the race from, the start/finish straight is very exciting and where a lot of the action happens. As well as the pre-race build up and post-race podium ceremony, spectators watching from here can expect a lot of drama from the start of the race and of course the chequered flag finish. There is plenty going on at this section of the race, so the main grandstand overlooking it is often first to sell out. Spectators will also have a good view of the pit lane exit from here. There is a TV screen to watch the rest of the race and this is also a covered grandstand, so will be a great place to watch the race from regardless of the weather. In the ‘Stadium’ section of the circuit, Europcar is a very fast corner – drivers will be doing speeds of around 240km/h through this right-hand turn and then making their way on to the last corner of the circuit, New Holland. Grandstands C and H have the best view of this corner, but Europcar can also be seen from B and G. A TV screen can also be seen from these stands, so spectators won’t miss any race action. Elf corner is the first corner of the circuit and follows a very long start/finish straight, which includes the pit straight. This corner is a very exciting one, particularly in the first lap. There is good potential for overtaking here as it is quite a slow right-hand turn and comes after a long straight. Cars can break from about 310km/h right down to 135km/h for Elf corner. Grandstands E and F have the best views of Elf. Situated right on the corner, there are also TV screens so the spectators can follow the rest of the race. Grandstands J and K also have good views of Elf corner, but are closer to the start/finish line and the pit lane action. TV screens are also visible from these grandstands. Grandstand A has views of Elf corner as well as the pit straight and the Seat corner, making this a very popular stand for spectators. Following on from the Elf chicane is the Renault corner. Visible from grandstand A, this is a popular place to watch the race from, because of its great all-round views. The main pit straight, both the right- and the left-hander sections of the Elf Corner and Seat Corner can all be seen from this stand. Following La Caixa, this corner is a 120km/h right-hand turn in the ‘Stadium’ section of the circuit. 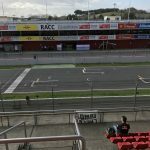 This section of the track can be very interesting as there is such a short distance between the three corners of La Caixa, Banc de Sabadell and Europcar. There are plenty of grandstands to get close to this challenging part of the race. B and G are best for Banc de Sabadell, and also have a view of a TV screen. This exciting left-hand turn is a 90km/h second gear corner and the slowest on the track. Following on from Repsol the cars have a short straight, where they can reach speeds of up to 240km/h. There is definitely an overtaking opportunity here. Grandstand L provides great views of this corner and because it is so high up offers spectacular views from the main straight right through to Wurth corner. There is also a TV screen to follow the rest of the race. Corner number 3 of the circuit is Repsol. Visible from grandstand L, this right-hand turn leads into the exciting Seat hairpin. General admission will also enjoy good views of this corner. Wurth is a tight left-hand turn following on from the excitement of the Seat hairpin and then corner 5. This corner is visible from grandstand N – a popular and affordable choice by spectators. New Holland is the last corner of the circuit before the start/finish straight and comes just after the entrance to the pit lane. This corner is a very important corner, especially in the final lap. It is also very fast – drivers take this corner with speeds of around 225km/h. Expect a lot of dust as drivers take to the curb of this final corner, speeding up for the finish line. Grandstand I enjoys the best view of this final corner, as well as a TV screen to follow the rest of the action. Campsa is an important corner in the race. Drivers will be doing high speeds of about 195km/h for this right-hand turn. Success at this corner is critical – a lot of lap time is often gained or lost here. Grandstand N overlooks Campsa and is well priced for the views it has to offer. Spectators watching from this stand can see the cars from Wurth corner all the way past Campsa and as they make their way towards the La Caixa hairpin. There is also a TV screen to watch the rest of the race. This left-hand turn hairpin follows a long straight after the Campsa corner. It is a tight corner and drivers have to slow right down after the straight before it. La Caixa leads into the ‘Stadium’ part of the circuit – that is the Banc de Sabadell and Europcar corners. 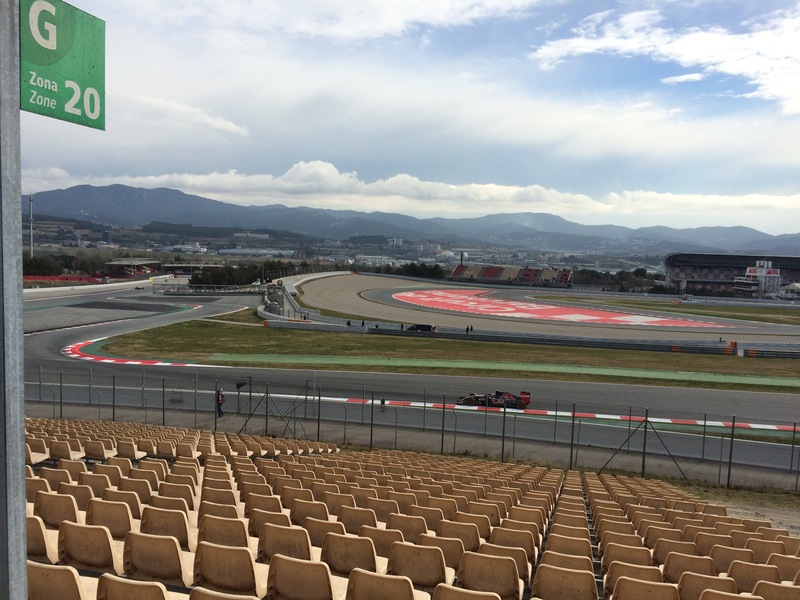 La Caixa can be seen from grandstands B and G.
Looking for something a little different? 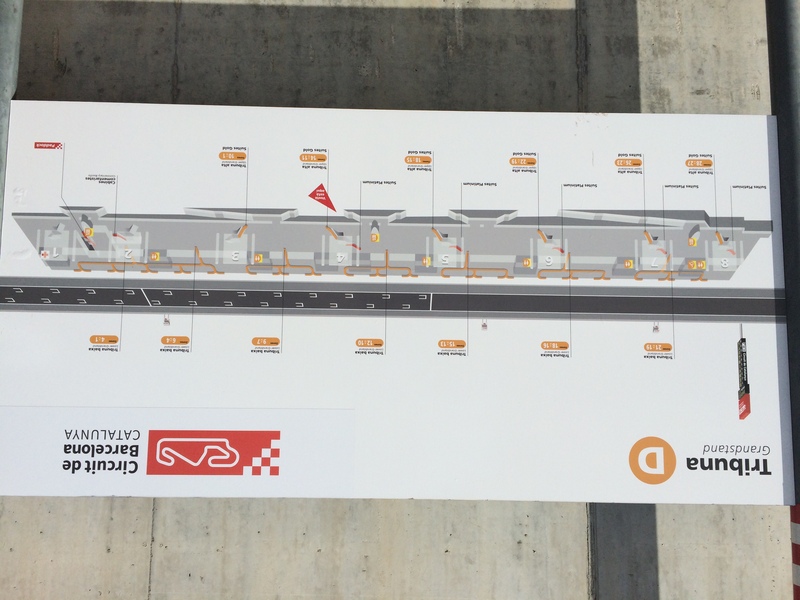 Check out our guide on the Pit Lane Suites and VIP Hospitality at the Barcelona circuit. Please do you have advice on the VIP Silver package and the view this has. Is it worth the money do you know? Would you agree the best place is the Grandstand (High or Low) or is anywhere you sit great due to the atmosphere? Totally out of my depth here but want to book a surprise 40th for my partner so advice welcome. The I Grandstand has an excellent view of the last corner and the pit lane entrance and pit straight. There’s a very good review on BookF1 from a customer who also treated their partner to the Silver Package at the Spanish Grand Prix. Click here to visit the site and click the magnify glass next to Stand I (4th one down) and select the reviews tab to read more. Sorry Pamela, I’m tagging onto your thread as I’m not sure how to start a new one. Simon, Ive noticed that spectators are allow to walk onto the start-finish line post race to watch the podium presentation. Who would be entitled to do that, in terms of grandstand ticket holders only are general public aswell? Hi Scott, The grand prix is the last race of the day so the track is open to all. We are travelling to Barcelona for the F1 GP this year and are thinking of getting GA tickets. By all reports these are value for money. 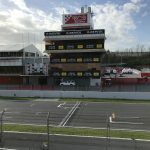 One question: I am concerned about the drink and food prices inside the circuit, and I’ve read that in recent years that the authorities have been confiscating beer in plastic bottles at the gates. Is this really true? What is the current circuit policy? The GA tickets at Barcelona are excellent. I’ve just returned from F1 Testing and I think the GA tickets offer some of the best views of the circuit. They did check your bags on entry, but we didn’t have any beer so I don’t know if it would have been confiscated, I guess it’s not uncommon for drink to be taken confiscated these days. Beer in the circuit was 6 Euros but I’m not sure if that will go up for the main event! Is anybody else able to help Hamish on this one? We’ve just got back from testing & the beer was alcohol free. Food & drink was reasonable I thought. If not a bit pricey. But not that much more. There are no metal items allowed inside the circuit whatsoever. We were told no alcohol could be taken in at all!!!!! I’ve heard people get searched on the way in to the circuit and digital SLR cameras are not allowed – (even if photos taken are for own use and not commercial gain) can you confirm this is the case? I can confirm that cameras are permitted in the circuit as long as they are only for personal use. Exceptionally large SLR camera lenses may not be permitted in the circuit for security reasons. If I buy a stand pass for the Sunday only, can I also get access to the general admission area? Once you in the track you’re free to sit in the general admission areas. You only need your ticket to enter your booked stand. Hi Simon, question for you. Im looking at tickets in the stadium area either B or G but I see there are also “zones” listed. Can you shed some light on the different zones? Hi SK – I’ll jump in here! Yep the sale of alcoholic beverages is forbidden at Circuit de Barcelona-Catalunya. Sorry not sure about evening entertainment, where are you staying? This may be an odd request but I’m wanting to go to the Spanish grand prix next year but I want to take my mother. She’s quite spritely though elderly. Would you recommend any particular grandstand which wouldn’t have too many stair? Can you give me an idea of your budget and I’ll take a look for you. Wine with alcohol in a plastic bottle and other picnic equipment went through a security check fine. Waiting line for sagales busses was about 35 minutes after a track walk. Sagales bus was a more pleasant expirience than the regional train to montmelo. That is a helpful comment, especially when I’m reeling from the no beer!!! I will be travelling next year to Barcelona for the F1 GP, and will buy tickets for the Main grandstand low. Could you please advise which zone will be better to sit? what zone is located in front of the podium? Take a look at this image the podium is opposite sections 1 and 2. If you use BookF1 add a note when booking to ask for the section you require. Hi Josh, What can I help you with? Hi Rachel, The choice on where to sit is a lot down to personal choice. The finishing straight not only gives you a good view of the start and finish but you’ll also have a good view of the pits. I think H offers a better view than C but both are good spots. I’m sure he won’t be disappointed either way! Have you tried Boof1.com, they have a sale on until end of February. I think it’s worth going to qualifying not only for the excitement but it’s also good to get your bearings for the race day. Qualifying will finish early afternoon so you’ll still have the late afternoon to spend in Barcelona. Hope that helps! Hi Simon could you advise me were would be the best viewing for my first time at a F1 event. I would be interested in some over taking views thank you. Hi Paul, What’s your budget? I would recommend checking out the end of the main straight, turn 5 and turn 10. Price for the Spanish GP are very reasonable compared to some of the other European races. The general admission area is also very good with some excellent grass banking. No alcohol sold! Is that true? I´m not an alcoholic but was hoping for a few cold beers in the sunshine watching the race. Hopefully they will allow alcohol in plastic bottles through. Yep it’s true, I was there for pre season testing last year and enjoyed a nice point of Free beer only to find out later it was alcohol free! They also check your bags on the way in! Hi. I have grandstand G row F13 and trying to find a seat map to see exactly where these are. Are they the front row of the top half of G? Hi Richard, How about this for service..
My two sons are treating me to The Spanish GP. We have general admission tickets and will arrive by public bus/coach. We need to find a suitable place to sit on a grassy bank without having to go too far from where we will be dropped off by bus. Sounds like a plea for basic help but I am 73 and cannot walk far because of back problems. Any basic advice would be much appreciated. Hi Peter, There’s plenty of grass banks between corners 6 to 9 of circuit de catalunya. which isn’t far from the gate 7 https://goo.gl/g4Hn2i. Take a look on Goole Maps. The following is a view of the bank thanks to Google street view https://goo.gl/GeBmlP. I hope this helps but get back to me if you need any further help. And have a great time! Thanks very much for your help. I am sure we will have a great time. It’s a first GP for my sons but about my ninth, but I need my minders now! Hi there, you’ve commented on how good the general admission tickets can be; what time do you have to arrive on race day to grab a reasonable view? Within the grass banks, what are the best viewing areas? Hi Naeem, You need to arrive early, very early people start queuing well before the gates open to get a good spot. I always recommend Vale from my personal experience. But there’s plenty of great spots. I’d recommend going Saturday too, so you get chance to check out some of the best spots. Hi Shirley, Great choice I sat in this grandstand to watch testing. It has a great view and is also close to the entrance refreshments and toilets. Hi… we have GA tickets for this year and was wondering if i can enter the pit walk on the Thursday and if so…what does this involve. I think i read somewhere that some drivers/ cars may be around on the day for autographs etc? Hi Brian, A free pit walk will take place on Thursday 12th May between 4pm and 7pm for three-day and Sunday ticket holders. I hope you have a good trip, please keep in touch over the weekend with out twitter account https://twitter.com/enterF1. hey,travelling pretty far to barcelona to watch the race on sunday, have looked online but still cant decide exactly where i should book seats. 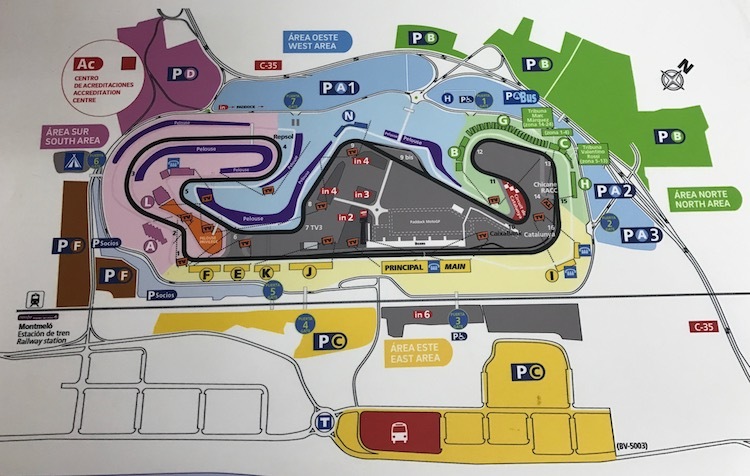 I dont want to haveto go in super early gor GA and then sit on the grass, although i have done so many times at other circuits but i dont knoe much about this one. My budget would be about €300. Hi Rebecca, Tickets for the Spanish Grand Prix are such good value, I’m sure you won’t be disappointed what ever you decide on. I’d recommend checking out H, L, A or N if you’re looking for something a little cheaper. Check out BookF1.com for more details. I hope you have a good trip and please keep in contact we’d love to hear from you during the race, our twitter account is https://twitter.com/enterF1. 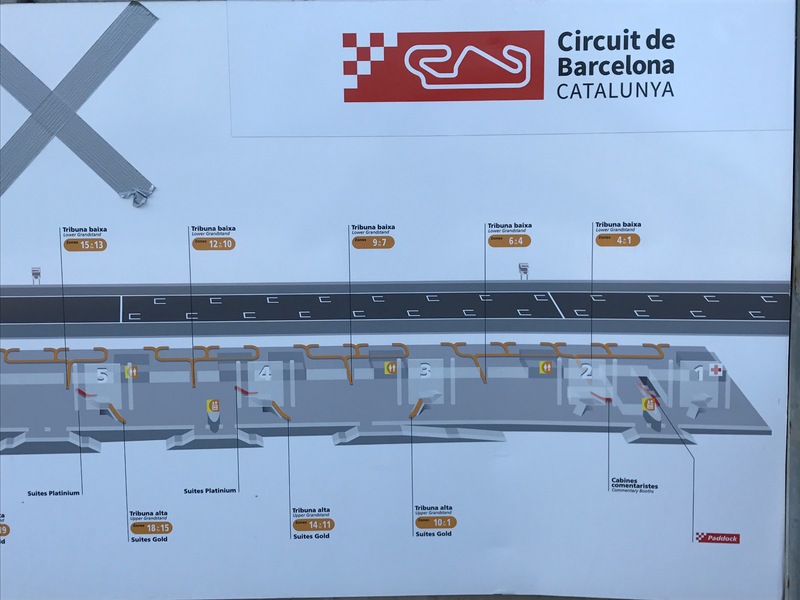 We have seats in grandstand A for the whole weekend but were wondering if Barcelona is a circuit where you can run onto the track after the race? If so, are we in a good spot to get to the podium for the presentations? Hi Becky, I’m not sure they can stop people from entering the circuit now. But your Grandstand is at the end of the start/finish line at the first complex of seats. It looks quiet away from the podium. You’ve chosen a great spot to enjoy the weekend. If you get chance to send us some pictures or can even do a review we’d love to hear from you. Our twitter account is https://twitter.com/enterF1. Simon, you kindly gave me some advice about where to head for in GA with the minimum of walking (being 73 with a dodgy back-although accompanied by my two strapping sons). It was to head for corner 9 which means we can also head down to Corners 5-8 still in the GA area. However you also advised using Gate 7 and despite deep research I cannot find out where gate 7 is especially in relation to the main entrance where presumably the Bus/Coach will drop us off? Sorry to be a pain but it would be nice to plan etc. Hi, do you know if the ban is for alcohol specifically or is it glass bottles? (e.g. could we bring a carton of wine to the circuit?) And how closely do they search people? This is the official information from the circuit.. 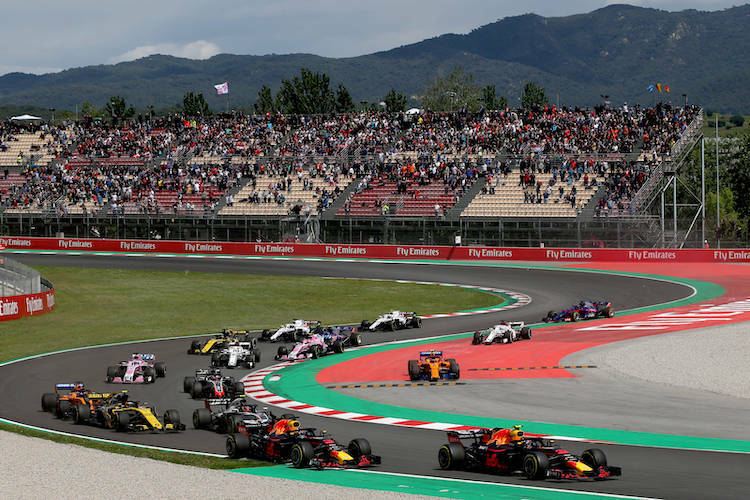 The sale of and access to Circuit de Barcelona-Catalunya with alcoholic beverages is forbidden. Soft-drinks and alcohol-free beer will be available for sale at the different sales points inside the facilities. In order to access Circuit de Barcelona-Catalunya with beverages, please be reminded that following the regulations of Royal Decree 203/2010 from 26 February, the containers must be made of plastic, laminated paper or similar material and in no case may be heavier than 500 grams in weight or 500 millilitres in volume. The security and control staff at the access gates reserves the right to take off the caps and covers of the containers. Containers made of metal, glass, ceramics, wood or any other similar material cannot be taken into the facilities. Hi, we are going to Barcelona this weekend but we will have small luggage bags with us. Is there anywhere to store these like luggage lockers does anyone know? I’m looking at booking a 3 day ticket package for a surprise gift.My options are limited to stands B, G, A,L,H or M. I haven’t a clue which are best seats to go for, could you advise please. Hi Vic, very straightforward by train to local station and then use public transport or taxi. Hi Simon. Thank you for the wonderful advice I have seen scrolling through the comments. I am looking to bring my 8 year old son to the Barcelona Grand Prix in May 2017. He is F1 obsessed. Me…less so. Ha ha. Am I right in saying that I can have a General Admission ticket for myself and my 8 year is free? Do I have to get him a ‘free’ ticket or is he just allowed in with me? I am thinking just for the race day as he can’t miss school so ill arrange my flights accordingly. After the race are we allowed to walk on the track towards the podium for the ceremony or is that only for those around that area? Also what public transport is there to and from the venue to say Barcelona City centre? Hi Sean, I’m glad you found the site useful. The Spanish Grand Prix is a great choice with so many options to watch the race. Grandstand tickets for 6 or over or 50% of the Adult price. For General Admission entry children under 12 are FREE and don’t require a ticket. If you’re using the Book F1 site you need to click on ‘show child tickets’ in the right navigation. There are coach services from Estacio del Nord, Ali Bei street, 80 in Barcelona and another service that starts from Lloret de Mar and runs along the coast before heading to the circuit. Or you can take a train to Montmelo Station where you can take a transfer coach to the circuit. Have a great time and please share any pics! We have main tickets but i like to know where exactly we are ought to be seated. On the tickets it says row F 20. Any idea? Can anybody help with a seating plan for the main grandstand? Anyone able to help with where I can find a reliable seating plan for what I believe is the Main Grandstand. How easy is it to get from Grandstand L to the podium presentation. Is there any issues getting there in time to see it. L is quite away from the podium. I’m sorry to say I don’t think you’ll be getting the best of views by the time you get there. We’ve gotten tickets for the J stand but I’m wondering if B or G would have been better? It was kinda hard to make a pick..
J looks good to me! hopefully a prime spot for some overtaking! Can you purchase beer from the F1 campsite but we are staying in Barcelona so will we be able to enter just with our F1 ticket. If not is there any bars close to the track to nip out and grab some lunch and a beer? Hi Shaun, I’m not sure about the rules at the Campsite only that you’re not able to take alcohol into the circuit. There’s not much around the circuit although the local town has a bar at the train station, La Moreneta. Hi. I’ve just received my tickets for the Spanish Grand Prix. Sitting in the main grandstand area est row F21 in zone 16. This means nothing to me. Where can I find a seating plan? Hi Karen, I’ve just sent you a photo of the Main Grandstand layout. I hope it helps, looks like you’ve got a good location! Hi, do you know if its possible to buy this years Moto gp tickets on the gate on Sunday ?? Hi Shaun, I’m sorry I don’t know have you tried contacting Silverstone direct? Hi John, All tickets are three-day only except for Stands E and N, which can be purchased for individual days. General Admission is also be available as a Sunday only ticket. Friday is roving seating, so all weekend ticket holders can sit in any available seat in any grandstand (excludes Stand E and N ticket holders). Hi Viadut, I’d go for stand K due to the high speed and a chance of overtaking into the first corner. But I would say it’s down to personal choice. Stand G is a good spot and you will see the cars for a greater time. Hi. We have grandstand G, zone 5, row F23. Do you know if they are the front row or on top of gramdstand G? Children under 12 have free entry to the general admission area and no ticket is required. Hi Simon, I see you give good advice about the Spanish GP. My daughter has paid for two GA tickets for my 60th birthday, I was wondering if you could answer two query’s I have? I notice the GA areas are slopped is there room for a couple of portable camping chairs as my carcass wouldn’t be up to sitting on the ground for all that time? And secondly I noticed remarks about digital cameras and zoom lenses I’m thinking of taking my Canon with a 70-200mm lens would that size of lens be allowed at the entrance? I look forward to your reply and offer thanks in advance. Do you know of any venues outside of the Circuit de Catalunya that are showing the Grand Prix. A friend with disabilities will be in the city over the event weekend and wanted to know where he can view the race in the city. Hopefully these images will help..
Hello Simon, trying to find the main grandstand seating arrangements without luck. I notice Karen asked you the same q last year and you replied with a photo 9/5/17. Any chance of posting on here please? Hi Chris, Does this help..
Would you advise the Main Stand or Stand K? Hi Elaine, The advantage of the main grandstand is a view of the start and you can also see some of the pit action. Hello, I am planning to watch the Barcelona F1 GP with my son this year. We have never been in an F1 GP before. I understand that the most attractive features to have a good view to, are: A. take overs B. pit stops and mechanics C. high speed/acceleration sections (please kindly recommend something else if I am missing something). Would it be possible to recommend best seats for A, B or C. and ideally combinations of them? (e.g. high suitability to see take overs and high speed or acceleration or view to the pit stops). Also, would you recommend high or low seats? (pros/cons). Hi Alexandros, It normally comes down to budget! Further to your comments I’d recommend looking at the following.. For A stands A and F, For B you need seats in the main grandstand opposite the start/finish line and a great view of the pits. I would sit half way up if possible. 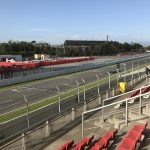 The main grandstand will also cover a view of the straight from the last corner. I’d also recommend grandstand H which is a slower part of the course but has a great view of the slower part of the course with some good braking and acceleration. Hi Simon, I’m looking for some advice if possible please. I’m taking my gf to Barcelona for her birthday with the intention of going to the race day on the Sunday. I’m stuck between GA or E. I know it comes down to personal preference and budget but would you say there is a massive difference in regards to paying about £200 per ticket more to sit in E compared to GA. This would be her first time to an F1 race after being a fan for many years, so I know she would be happy with either tickets but I feel she would enjoy E more with the view of the first corner compared to sitting on the grass with a limited view and supposedly no/limited TV screens. Any help is appreciated. Hi Ben, I have to agree, although general admission provides some great views of the track you can’t beat having your own reserved seat and not having to worry about arriving early to get a decent spot! Hi Abbey, I’m with you on Grandstand A great action of the high speed corner after the start/finish straight. Should be great for the start. I know H is very popular as you get a great view across the last part of the circuit. So both good choices in my opinion! Hope that helps.